To the novice who doesn’t understand the sport, a cycling race might not always make sense when watching it on TV. It’s like watching a chess match when you don’t understand chess. The initial moves have an effect on the outcome even though you might not see it at that moment. At the same time, some viewers are experts and have a great understanding of the sport. This is something which can make the commentator’s job a little difficult. The man behind the microphone caters to a diverse audience and needs to add value to the pictures. 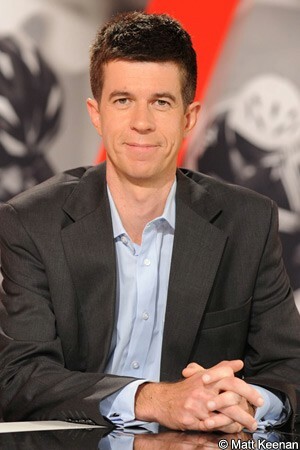 Matt Keenan is a seasoned broadcaster who commentates on races like the Tour de France and Vuelta a España each year. We spoke to him to get a deeper understanding of the role a commentator plays and to get his predictions on the year ahead for some of the top Aussie talent. VeloNation: What does an average day look like for a commentator at a stage race? MK: A fair portion of the day is spent in the car before and after each stage, getting from the morning’s hotel to the commentary tribune, which is always at the finish line, and then to the evening’s hotel. In between that I do my research scouring the Internet and newspapers, talking to the other commentators and journalists, and the riders and team staff for various bits of information I can use in commentary. My objective is to find information that’s not already in the media so I’ve got something new to say. But with the quality of some cycling websites and blogs it’s hard to find fresh information. Cycling is blessed with some great bloggers. The best way to get new information is talking directly to the riders and team staff. You can learn a lot from the mechanics and soigneurs, if you can get them to open up. Once I’ve got all my notes together I’ll grab a bite to eat and then it’s into the commentary box. Depending on the race this is normally two-to-three hours of calling. At the Tour de France, however, it can be as little as 15-minutes on some stages and up to three hours on others. After I’ve called the start of the stage at the Tour I then work with the editor of the half hour highlights packages. I also put a small note at the bottom of the TV monitor I commentate from that says, “Add value to the pictures”. So rather than describe what’s happening, as you would on radio, I try to describe why it’s happening. Obviously I don’t always achieve that but it’s what I aim to do. VN: You're very good at recognising riders when they attack, long before they get strapped on the screen. How do you do that? MK: I put a lot of effort into being able to identify the riders. 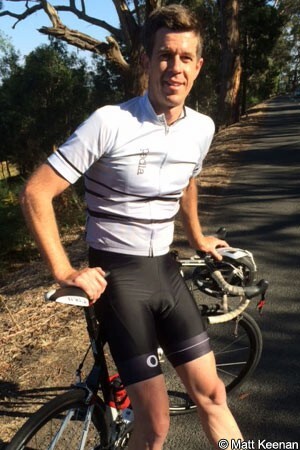 I do this by looking for small distinguishing features – sock height, shoe colour, pedalling technique, national champions bands around the sleeves of a jersey, understanding each rider’s role in the team…the list goes on. My favourite conditions to commentate in are wet, miserable days, where riders all have rain jackets on and you can’t see their race number. This really tests a commentator’s ability to recognise the riders! VN: What is one of your most memorable moments from a race while in the commentary box? MK: The 2009 world championships in Mendriso. 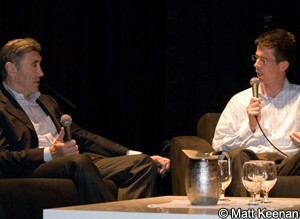 I first met Cadel [Evans] at the local bike shop in about 1992. So to be part of the commentary team calling him across the finish line as the first Australian to win the elite men’s road race at the worlds was a privilege. VN: As you are an Aussie, I have to ask you these questions...Cadel vs Porte at the Giro, how do you see that playing out? MK: I see both of them having to beat Nario Quintana to win the Giro. Richie has the goods to win a Grand Tour but it’s a long way from seventh at the Giro, as he did in 2010, to first. And Cadel is the proven entity across three weeks. Richie has all the weapons to win but that one bad day in last year’s Tour will give his rivals the confidence to keep chipping away at him. I’m convinced he’ll win a Grand Tour at some point in his career. As for Cadel all the early season signs are good and you just know he’ll be in the mix. VN: Any Aussies who might surprise this season? MK: This could be a long list. First, Rohan Dennis. Last year at the Dauphine was a breakout performance from him and I expect him to confirm his class this year. He has the potential to win any one-week race with a time trial in it. Michael Hepburn is finally turning his attention solely to the road. He’s a dual individual pursuit world champion and can be a factor in the cobbled Classics in the future. Then there’s Jack Bobridge. As the individual pursuit world record holder his pedigree is well known but it has been a tough few years. But from what I’ve seen during the Australian summer he’s back on track to realising his potential. Nathan Haas is on notice at Garmin-Sharp and has started the season well with fifth at the Tour Down Under. Watch out for Simon Gerrans at the Tour of Flanders. I know, as a surprise, that sounds odd given what he’s already done. He’s only ridden Flanders once but it’s on his to do list. It’s rare he doesn’t tick off the items on his to do list. Longer-term keep an eye on Robert Power, Brad Lindfield and Jack Haig. VN: How good will Cam Meyer really be? This is an important year for Cam. Not make or break but important in confirming that he’s worthy of the team’s backing as a future leader. Long term I expect him to be a contender for races like Paris-Nice, Criterium du Dauphine and the Ardennes Classics. I’m looking forward to seeing who has a better CV at the end of their career between Cam and Rohan Dennis.